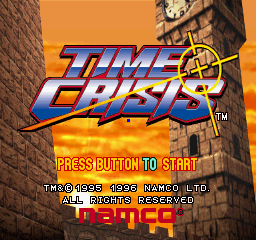 Time Crisis is a light gun shooter arcade game released in 1995. The PlayStation port was bundled with the Guncon light gun controller, which was released alongside it. 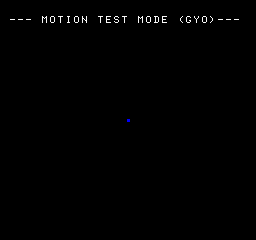 Use the following code, then press L2 on Controller 2 (using a regular controller) at the title screen to display a debug menu. 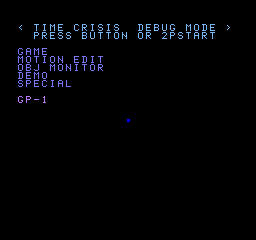 All debug menu options must be controlled by Controller 2. Choosing GAME returns you to the game, while SPECIAL currently does unknown things. Square, Circle: Change the number. A model viewer to see 3D model parts in the game. Triangle, X: Change the object. 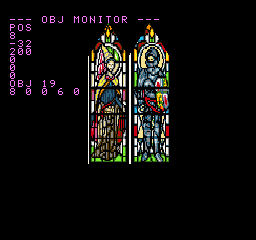 Remove everything that's actually used by the aforementioned debug mode. The file SLUS_004.05 contains various development and debugging strings. This page was last modified on 14 February 2019, at 09:53.